Hi all. I love writing about supernatural things. As a young adult, I maintained a fairy garden until I moved due my job. I like fairies because they are smart, magical and basically have a good-nature, but mainly because they can FLY. Here is the link to the video trailer. Creole Moon Book of Roots by S.T. Holmes is an amazing whirlwind ride that begins in the heavens with Mamuska being told to leave his wife Ophelia behind when he returns to earth. As if that was going to happen. He just could not abandon her, so they both returned to the Louisiana Bayou country after 100 years. Awaiting their return is George, who is their reluctant servant of sorts when he is not the swamp beast known as the Luxican. In the meantime, the arch rival goddess twins, Sephora and Vollera, have possessed bodies of women to help them search for the coveted Book of Roots. It's been 100 years since they have all been to New Orleans and they return to a changed city, just in time for Mardi Gras during prohibition. George is assisting an old woman named Marie, Sephora's present host body, as she searches for the clue to find the book. There are surprises in store for the twins when they learn that George can read their thoughts, just as they can read his. George in his human form struggles constantly internally to keep the beast from emerging. When the sisters finally meet and confront each other, spells and voodoo chants start flying in abundance to gain an advantage in victory. S.T. Holmes does a remarkable job of moving this story along, with the quest being slightly interrupted by the histories of how the twins became not only rivals, but arch rivals. I was instantly reminded of the series introduction to the Adventures of Hercules, depicting the gods of Olympus and their pettiness. Only this author's version goes way beyond that, as if their lust for power is on steroids. Holmes's story telling and descriptions of New Orleans at that time are just so vivid that I felt as if I were there. The internal struggle for George to keep his inner beast at bay kept me on edge every time his eyes began glowing green. Creole Moon Book of Roots is a suspenseful work of art that really delivered on all levels for me. This is an entertaining read that keeps you on the edge of your seat as each of these well developed characters aspires for superiority. All I can say is, "Wow! Well done." It was the year of the Creole moon, the time of year best for beings of magic to regenerate and recharge. This time, however, it fell in line with a festival and a prophecy. Long ago this prophecy was woven, the prophecy of the Luperci, and already the signs are there to see. A priest had placed a hex on all magic, and events suggest its end is nigh. If there is any hope of saving magic, the Book of Roots must be found before the Mardi Gras day ends. This is the only chance to reverse the spell, and if they fail all will be lost. Clues litter the path, guiding the way. There are two who seek to possess the book, those of good and those of evil. Old enemies surface, stirring thoughts of revenge amidst what will prove to be the most spectacular festival ever seen. Book of Roots is the second book in the Creole Moon series, and while it is clear that the events of the previous book would add to a reader's understanding of what came before, author S.T. Holmes easily supplies any information the reader would need to enjoy this as a standalone story. I really enjoyed the treasure hunt/quest aspect of this book. Filled with magic, mystery, adversaries, revenge, schemes, and a ticking clock counting down to disaster, it doesn't get more gripping than that! This is a book filled with atmosphere, and you can really picture yourself amidst the bustling streets, or hunting down the next part of the riddle. The ultimate sibling rivalry with the highest imaginable stakes and a side helping of revenge are all presented in a well written and engrossing manner, addressing the internal and external struggles of all the characters involved. Creole Moon Book of Roots by S.T. Holmes is a supernatural novel written by S.T. Holmes, a tale that involves magic, witchcraft, and voodoo. With a fascinating setting in New Orleans, the story follows a conflict between two sisters, Mamuska and Ophelia, both fighting to win George Genois, the protagonist, as an ally. But there is more at stake than George, and it is what lies in the swamps. George Genois has suffered a lot of harm, thanks to an evil done to him earlier. Now he is about to get his revenge, but can he master what lies deeper in the realm of magic? And which of the two sisters can uncover the secret to controlling the magic Book of Roots? S.T. Holmes’ novel is brilliantly plotted and written in a style that is engaging. The prose is excellent and the author’s style and precision are elements that readers will immediately notice. Engaging conversations are scattered throughout the narrative. The author has the gift of creating scenes that are emotionally charged, evoking images that will delight readers. Here is one of the images that capture the atmospheric nature of the writing: “Before Ayida spoke again, dark clouds lined overhead, a crack of lightning flashed through the sky and low sounds of thunder rumbled through the air. Her long, silky white hair flew out and around her head and face with the rhythm of the wind.” Creole Moon Book of Roots is pure delight, a little gem of a book that will draw readers in. I enjoyed the well-developed characters as well as the author’s storytelling skills. Creole Moon Book of Roots by S.T. Holmes is a mesmerizing story that is well-crafted for fans who love their stories distilled with magic and featuring compelling characters and a strong conflict. In this spellbinding story, two sisters are poised against each other, fighting to gain control of the legendary and magical Book of Roots. The reader follows the path of George Genois whose experience of magic pulls him deeper and deeper into an intricate plot, and while he is out for some revenge, the two sisters opposing each other want to win him over to their side. But does he have what it takes to right a wrong once done to him? Who really owns the power to control the book? I was grabbed from the very beginning of this story by the author’s great skill in creating setting. With powerful prose and an exceptional way with words, the author captures unique and relevant elements of the setting. The world of the characters is filled with mystery and readers will feel enticed and drawn to the power of the swamps. Readers are introduced to an interesting cast of characters, including goddesses and demi-gods, witches, humans, and many others. The plot is intricately done and readers will be keen to find out what happens to the characters as they follow the intense drama. S.T. 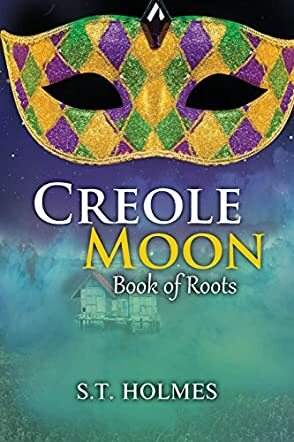 Holmes’ Creole Moon Book of Roots is a compelling blend of mystery and fantasy, a story that is gripping and entertaining.